Barcelona and Madrid are the most visited cities in Spain, but there are many more amazing places this fascinating country has to offer. One of those is undoubtedly Santiago de Compostela! In this blog post I would like to explain what makes this spectacular city in the Spanish region of Galicia so special… and why it is absolutely worth taking your next language course abroad in Santiago de Compostela! 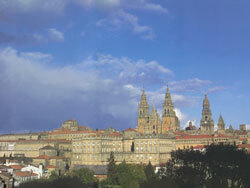 Study Spanish in Santiago de Compostela – a gem of a city! I’ll be honest, I knew NOTHING about Santiago de Compostela before I arrived. A pretty poor show on my part, I know, but my university suggested the location, the dates, put us in touch with the company who arranged my Spanish course… I just went with the flow, paid my money and turned up at the airport on time! 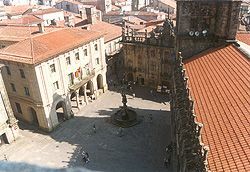 And I’m so glad they chose Santiago de Compostela – it really is a little gem of a city! It is so unspoilt, small enough that you can walk pretty much everywhere, not to mention the fact that it is downright beautiful. The old town is incredible; I’ve been all over Spain and never seen anything like it. The stone cobbled streets are smooth and shiny like glass, from so many centuries worth of people walking those streets, (but watch out, those smooth cobbles get very slippery when it rains!). The buildings are breathtaking, everything is so well preserved, you really can imagine that this is exactly how the city looked 600 years ago… I felt like I was exploring an amazing movie set! And the great thing about Santiago is that the old town is still a thriving, active part of the city, not just ‘a bunch of historic buildings’, which let’s face it, are great to look at but sometimes a bit soulless.